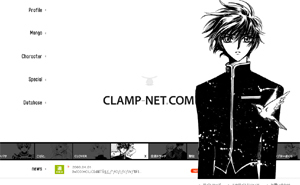 It’s already April 1st in Japan, therefore, CLAMP-NET.COM has been updated with its new design!!! I’ll be back later with my CLAMP NEWS !! post! ← Gate 7 first picture !!! I can’t say for sure, but isn’t that the first time they’ve really used “non-original” artwork on the page? :O It’s so pretty. Certainly not in this level! I’m pretty sure it’s the first time. Thanks for the update! Now I need to wait for it to load, Clamp-net hates my connection. I did my best to quickly look through everything, though I was a bit sad to see that in the character guides they don’t have Wish’s characters. I think anything under 4 volumes didn’t get recognition there because it wasn’t the only one…expect for Gouhou Drug….I was ecstatic to see them come up on the main screen. The design is simple but I liked it. i fell in love with the page, it looks amazing! thanks a lot chibiyuuto-san! It’s truly stunning. Simple, clean, really, REALLY attractive… Amazing, gorgeous…! It’s really great! Very simple and with all the stories. Who is the girl with the dog? Is it from the new mangette or what? I just checked on that girl, it’s from WnSnH. I didn’t know they even put that one there.